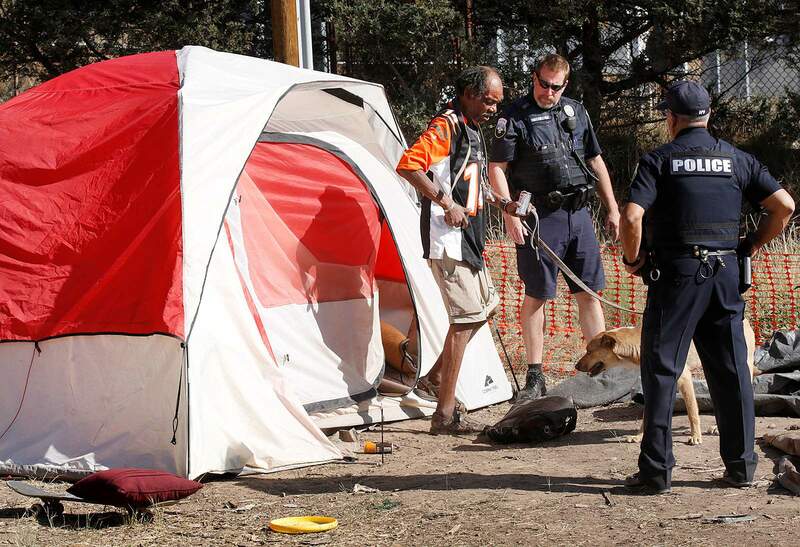 07-23-018- Durango- Durango Police Department officers, Jim Martindale, center, and Leonard Martinez, assist, Astro (Grandpa) out of his tent on Monday morning and making sure all the residents in the city of Durango’s temporary homeless camp near Greenmont Cemetery have left camp. Durango City Council made a significant effort this summer to understand the issues that involve the homeless and to aid in their overnight sleeping conditions. Time was spent learning what was occurring in the informal, self-governed camp just beyond the Tech Center and outside the city limits (and what the risk of fire was). Then the homeless were welcomed at Escalante Elementary School during the early days of the 416 Fire. When that location was closed – homeowners displaced by the fire were returning to their homes – a camp was established near the entrance to Greenmount Cemetery. During that time, locating a camp at the west end of the Durango Dog Park was considered, and eliminated, as it looked as though some extensive soil testing would be required at the former uranium mill and mill tailings locations. Some camp rules were set for Escalante and Greenmount about alcohol and drugs and requiring breaking down tents in the morning, all of which required some research and thought. Not everything went smoothly, as occasionally there was some disorder and minor fighting. Requiring that tents and gear be packed up by 9 a.m. understandably triggered pushback, as it is difficult to think about any employment, however limited, or productive ways to spend the day, if one’s “home” has to be re-established every evening. Given the council’s multiple efforts, some successful and some needing adjustments, we were surprised when the council announced a week ago that it would no longer make an effort to provide overnight accommodations for the homeless. Greenmount had been closed, and there would be no further camping on city property. The homeless are now back to making do with whatever they can organize at the west edge of town, where sheriff’s officers will patrol, and with individual sleeping places tucked in, out of sight, around Durango or on its fringes. Whether a hands-off approach by the city will be effective remains to be seen. Panhandling has become more difficult with an effective “ambassador” program that discourages locals and tourists from giving handouts, and with the city’s no sit–no lie sidewalk and alley rule. Summer is winding down, and in a few weeks, cool temperatures will be here, making street living less comfortable. Homelessness is present in most towns and cities in this country and abroad, and will continue to be. Mental health issues play the largest role, plus the desire to be responsibility-free and to roam. The high cost of shelter is also a factor. Each case may be different, requiring almost one-on-one intervention and multiple resources. That is expensive, and results may not be assured. Cortez’s The Bridge, in existence for many years, has had some success on a small scale in improving lives in that community. Durango made good efforts this summer to put some boundaries on homelessness, but the cures were lacking.